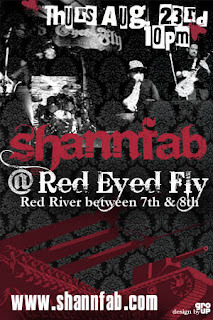 From the "the big day's coming" department... Shannfab @ Red Eyed Fly on Aug 23rd, Thursday, @ 10pm. Shann•fab (shann fab), n. more commonly known as a nuclear explosion, occurs as a result of the rapid release of energy from an uncontrolled nuclear reaction. The driving reaction may be nuclear fission or nuclear fusion or a multi stage cascade of both. The degree to which Shannfab succeeds in this race determines its efficiency. Poorly designed or malfunctioning Shannfab may "fizzle" and release only a tiny fraction of its potential energy. Shannfab has been environmentally tested at the Dirty Dog, the Copa Bar, Caribbean Lights, the Factory Haunt, and the Red Eyed Fly in Austin Texas.